We’ve got everything you could ever want in the way of luxury, and so you’re very welcome to have a look at the products we stock with a longer pile height than average. Combined with an innovative and unique weave, you’ll find that our artificial grass doesn’t just flawlessly match the look of grass, but also manages to perfectly mimic the way it feels underfoot and to the touch. If you’re the kind of person who’d prefer the quick, easy and simple approach when it comes to putting down an evergreen lawn that’ll shine all year round, however, we’ve certainly got no shortage of artificial grass products that’ll help you out without breaking the bank! We understand that sometimes the grass in your garden is the last thing you want to be shelling out for, especially when you’re saving up for something like a holiday and you might not even have the time to browse the internet for the perfect thing. Of course, if time is a concern, the low maintenance factor of all of our commercial artificial grass products should be an extremely tempting prospect for you. You’ll only ever have to give your brand new artificial grass lawn a once over with the brush or hoover to remove any excess build-up of fluff and naturally occurring moss, and our design will take care of the rest! Enjoy free draining systems guaranteeing the rain won’t be getting you down, and a resistance to the elements which is certain to impress! 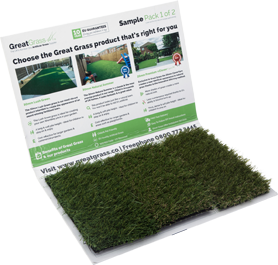 Here at Great Grass, we’re the UK’s number one commercial artificial grass suppliers, specialising in providing a huge variety of top quality products which can perfectly suit any budget or application. If you’re looking for the very best products offered with a dedication to customer service and satisfaction that’s sure to be to your liking, make sure you get in contact as soon as you can!